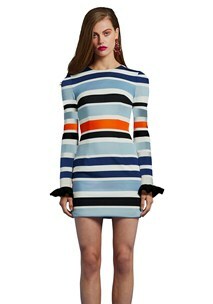 Bright and bold, yet sleek and flattering, the ‘Splice Drape Midi Dress’ is this season’s versatile staple. Choose whether you want a luxe, draped V-neck or sophisticated curved neckline, this garment can be worn either way. Relaxed sleeves and a slim waistline make this midi dress an absolute show-stopper.